In back-to-back procedures, Robert, 79, and Carol Zeller, 74, each had a biventricular defibrillator implanted on the same day at Elmhurst Hospital to treat a condition they both had. After Robert’s procedure but before Carol’s, hospital staff put their beds next to each other in such a way (as pictured), so they could see and embrace one another before Carol went into the operating room. It was a very touching moment, according to Dr. Casey. 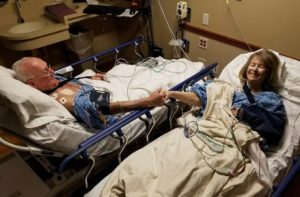 Robert and Carol Zeller seem to have taken to heart the ‘80s U2 song, “Two Hearts Beat as One.” In 2017, the Zellers, who have been a couple for 48 years, developed similar symptoms of congestive heart failure (CHF), a condition resulting from a weakened heart muscle. Both were experiencing shortness of breath and tired very easily. On March 21, they checked in to Elmhurst Hospital together to do something about it. After a series of cardiac tests, their doctor, John Cahill, MD, an independent cardiologist on the medical staff at Elmhurst Hospital, gave both a diagnosis of a condition is called dyssynchrony. It means the heart’s opposing walls contract at different times instead of together, as if your car’s spark plug timing was off – the vehicle would run, but not well. Dr. Cahill referred the Zellers to cardiac electrophysiologist Cash Casey, MD, another independent physician on the staff. Dr. Casey scheduled the Zellers to have the same procedure – implant of a biventricular defibrillator – on the same day, back-to-back. “It’s like their chests suddenly have built-in paramedics.” Kim said. To find out if you’re at risk for heart disease, visit eehealth.org/heartaware or call 877-45-HEART to schedule a heart scan.